They’re coming fast now. Not much more than a week after the second batch of proposals drops comes the third. Thanks to Morgan Churchill for keeping on top of the AOU’s actions and posting them on the ABA’s Facebook Discussion Group. The disclaimers that should be second nature by now apply once more. These are proposals on which the committee has yet to vote, or at least they have yet to make those decisions public. No decisions are official until they are published in The Auk, the journal of the American Ornithologists’ Union, this July. The entire list of proposals is available on the AOU’s website here (.pdf). We’ll focus on those proposals that affect the ABA-Area and Hawaii, which happens to be all of them this time around. The genus Oreomystis currently consists of two species, the ‘Akikiki and the Hawai’i Creeper, which were considered to be closely allied due to similarities in ecology, behavior, and tongue mophology. As it turns out, however, the nuclear DNA suggests that Hawai’i Creeper is actually much more closely related to the honeycreepers in the genus Loxops, which consists of the ‘Akeke’e and the ‘Akepa, and the similarities between it and the ‘Akikiki are the result of convergent evolution. Crazy stuff. Though the proposal places Hawai’i Creeper within Loxops, it may be that the species will actually require its own monotypic genus. Per usual, more study is required. 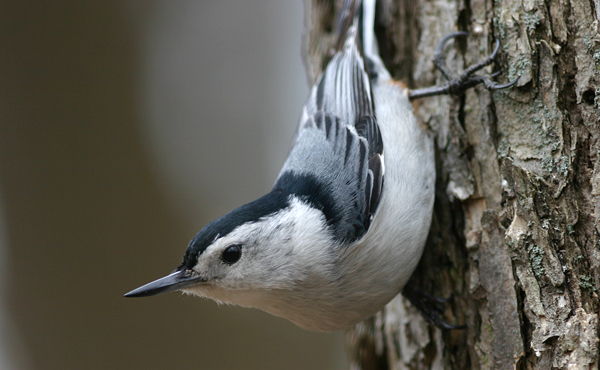 White-breasted Nuthatch has long been on the list of next potential splits based on obvious differences in vocalizations and subtle but consistent differences in plumage and bill size among the various populations. Moreover, those populations shake out in ways similar to established splits like the Solitary Vireos (Blue-headed, Plumbeous, Cassin’s) and the sapsuckers (Yellow-bellied, Red-naped, Red-breasted). Recent genetic work bears this out, with an additional fourth clade occupying the southern Rockies south into Mexico. If we’re going to see some sort of split here though, the question of how many species will be pared off of Sitta carolinensis is still wide open. A four species split seems least probable, but three species (which combines the northern Rockies nelsoni and the southern Rockies/Mexico lagunae) would correspond to the three known vocal groups. As work still needs to be done to determine the contact zones between the three western subspecies maybe a simple east/west division is the most likely outcome. Assuming, of course, this proposal passes muster with the majority of the committee. More rearrangement here, this time of the various families in Charadriiformes on which there has been a lot of recent genetic work. Among other things this proposal moves the stilts/avocets and oystercatchers ahead of the plovers and places the alcids right between the skuas and the gulls. The proposals above are consolidated as they are all essentially housekeeping that serves to bring the AOU check-list in line with various recent updates to the ABA checklist. Providence Petrel, Double-toothed Kite, and Asian Rosy-Finch are added based on naturally occurring vagrants in Alaska, Texas, and Alaska again, respectively. Fea’s Petrel is finally freed from its slashed purgatory as the species is recorded annually in North American waters and has been determined to be distinguishable from Zino’s Petrel in the field. The two species of parrots were recently added to the ABA checklist based on established populations in Arizona (Rosy-faced Lovebird) and Florida (Nanday Parakeet). Having not that long ago seen our goldfinches and siskins removed from the long-standing Carduelis genus into the old-but-new-again genus Spinus (which re-created the hilarious and fun to say Spinus pinus for Pine Siskin), it looks like they’ll be on the move once again. Those South American finches who had retained the genus Carduelis are now being reorganized into a much larger trans-hemispheric goldfinch/siskin group and Sporagra is apparently the oldest available name. It may turn out, however, that the North American goldfinches (American, Lesser, Lawrence’s) are distinct enough to get their own genus, which would likely be Astragalinus. Both are a pale shade of Spinus in this birder’s opinion, but we can’t have it all.